First the good news. The HP/A. 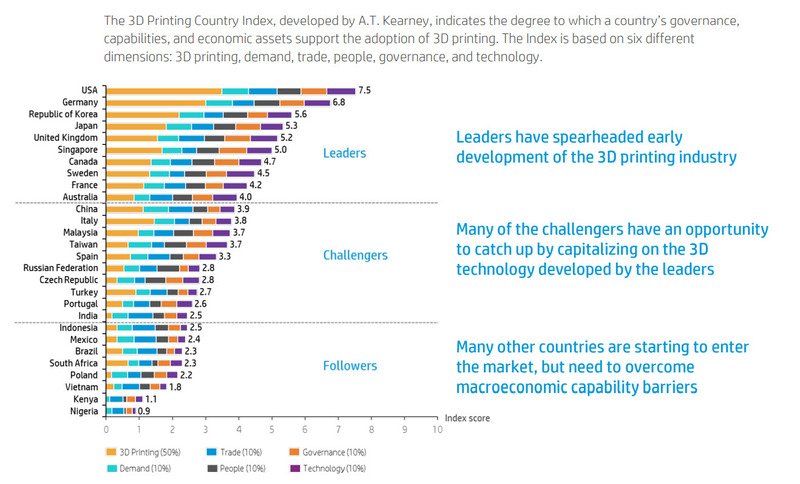 T. Kearney study found that the UK is fifth best placed globally to adopt 3D printing and additive manufacturing – behind the US, Germany, Korea and Japan (in rank order). Within Europe, Britain came in second – behind only Germany (placed second globally), and ahead of Sweden (eighth), France (ninth), and Italy (at twelve). And the UK’s standing looks set to improve further, as the country rapidly expands its 3D printing capability. Britain is the world’s third fastest nation accelerating its domestic 3D printing market, according to the research. Only South Korea (first) and Italy (second) are progressing more quickly. These positive statistics belie the real situation on the ground in the UK, where it is still early adopters and niche players making the running. The fact that Italy leaps up the charts when it comes to adoption is easily explained. Businesses there get tax breaks of 300-400% on investment in 3D technologies. Otherwise, the fact the UK is so well positioned can only be explained by the fact that in other European countries, besides Germany, the adoption of these technologies by mainstream businesses is even less mature than in the UK. This issue of barriers to adoption in the UK dominated a meeting on Monday 4 June of industry experts and academics arranged by the All Party Manufacturing Group at the House of Commons, in association with HP, and chaired by Barry Sheerman, MP for Huddersfield. The list of barriers is familiar: lack of skills and specialist training, lack of understanding by government, an overly cautious investment attitude and confusion about ROI among business owners, and a splintered business support structure. Much of the support available at centers such as the MTC in Coventry and the AMRC in Sheffield was praised by 3D specialist Graeme Bond, CEO of FDM Digital Solutions, but he said the vital bit – communicating the incredible power of additive manufacturing to engineers on the production line – is lacking. There was broad consensus that “showing rather than telling” remains the best way to persuade smaller companies of the powerful ROI that 3D printing can deliver under the right circumstances. Alex Monino, HP’s global VP for 3D Printing Strategy and Business Management, agreed, adding that the issue of government incentives, together with global agreement on quality and materials standards, was vital to giving the technology the stability it needs to bridge what he called “the chasm” between the initial uptake by early adopters and mainstream adoption. It was noted with some dismay that 3D occupied only a few short paragraphs in the lengthy Made Smarter Review that forms manufacturing’s contribution to the government’s industrial strategy. Barry Sheerman vowed he would make the case in Parliament and to ministers for the technology to receive the attention it needs. It was notable that neither he, nor many in the room, had seen the National Strategy 2018-25 report by the Additive Manufacturing UK consortium, which includes representatives from university research departments and the MTC, indicating perhaps that more is being discussed around the issue than is being communicated.